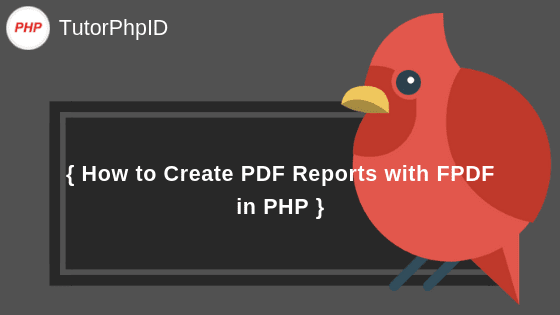 Good morning blogger friend this time I will share how to make PDF reports with FPDF in PHP. This is very necessary when we process a large website and always need printed data. But before that we want to explain what FPDF is. According to the official FPDF website "FPDF is a PHP class that allows to produce PDF files with pure PHP, meaning without using the PDFlib library. F from FPDF stands for Free" and it means you can use it for all types of uses and modify according to your needs. FPDF does not require an extension (except Zlib to enable compression and GD for GIF support). You can download the FPDF file from the official site they have at http://www.fpdf.org/ Extract the file that you downloaded earlier and save it in your htdocs folder. Like an explanation on their official website, FDPF is very simple in its use, ie you don't have to install it, you just call it with the require command. I took this tutorial from one of my web projects and I think sharing it is something that is very useful. Following are the stages. Creating a Database For the name, it's up to you, later you can adjust it when you call the database later. I just give the example according to my project. For the table here I give the name of the database named cms or your name and the table name tblcomplaint. For complaint table enter the following query. The table above has many queries but it is up to you to use all or only half of your needs, Namin I suggest that nothing be removed if only for learning and experimental materials. Then you enter the contents of the thickness above, the following you must enter. Next you create a file named report_filter.php and enter the code below. Now you can try it for yourself, I don't need to explain the details above, because I have inserted an explanation in each code that I think is important. So I highly recommend using this FPDF to check the report you want, you just need to enter the date and click search, the report you are looking for appears. PHP has very good capabilities in creating PDF files on-the-fly. FPDF is one of the PHP libraries that can be used to create reports and other PDF documents easily, without the need to install or activate certain modules. The PDF report produced also has a good and quality appearance.